When I chose to become an orthodontist, I was drawn to the fact that I’d be able to develop personal connections with my patients. I look forward to getting to know my patients and hearing about the happenings in their lives. As orthodontic care takes place over several years, and I see patients about once every six weeks, we have time to build a strong relationship. For me, helping people I genuinely care about develop a smile that will serve them well for a lifetime, is extremely rewarding. 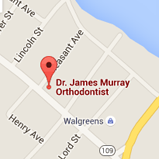 My father, Dr. James Murray, has practiced orthodontics in this area for thirty years. Our practice is now caring for the smiles of the children and grandchildren of his early patients. I care for my patients in the way I would want my own family members to be treated. The field of orthodontics is in my blood, but having a positive, lasting impact in someone’s life is really what drew me to the profession. The most satisfying aspect of my work is witnessing the growth in each person’s self-esteem and confidence as their smile changes and improves. Continuing education is essential for me to provide my patients with the best orthodontic care. I attended many conferences and lectures throughout the year. This ensures I’m current with the latest developments, skills, and technologies. 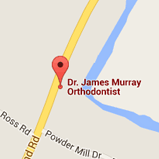 I’m one of the few dentists in Maine who is certified by the American Board of Orthodontics. My wife Sarah and I have three children: Will, Henry, and Caitrin. It has long been my goal to come back to the area where I grew up, raise my family, and contribute to and serve the community where I was raised. It’s good to be home. Spending time with my family is always my passion when I’m not seeing patients. I also enjoy boating, fishing, and woodworking.